We decided to buy a portable washing machine to take on extended camping trips. We decided to go with the Cyclone Wash Mate because it is small, convenient, and reasonably priced. We paid about eighty dollars for the Cyclone. It is a great appliance! The Cyclone holds the equivalent to one pair of pants, a shirt, and socks. It is very quiet and quick- a load is ready in about fifteen or twenty minutes. Also, you can use it anywhere that has an electrical outlet. The amount of water it needs to operate is approximately four liters. The capacity of the Cyclone is listed as seven liters. The Cyclone has a high and low setting. When we first purchased the portable washing machine, I honestly did not think it would be able to get out tougher stains. However, I was pleasantly surprised at how well it worked! 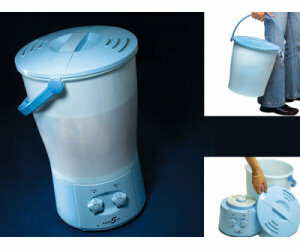 The Cyclone is capable of getting stains out of clothes just like a full size washing machine. I think this would be a great appliance for college students who live in dorm rooms or people who have limited space. The Cyclone Wash Mate is a great little item; I would definitely recommend it to a friend! Please do not confuse this device with others. Consider: What do you expect for such a low price. It does agitate the clothes reasonalbly well, but you will need to manually wring the water out...no spin dry feature at all. You will have to manually dump/fill, dump/fill, etc at least three times. This might do in a pinch, or for light loads of mostly nylon type material (ladies undies), but I consider it a back-up, emergency type washer. Yes, I have one my mother gave me. She should stop looking at all those "wish-book" catalogues. Thank you for the review. I will look into this. My son has started law school, but the nearest laundromat is 1/2 mile away and he doesn't have a car/bike/skateboard :) (take your pick). When the weather is not good, a mini machine might be nice to have (wish he could have a dryer, too).